I was feeling bored the other day while waiting for others to finish their lunch that I suddenly exclaimed: “I think I have magical powers.” Eyes immediately turned to me. “It’s true. I tried killing a cockroach last night but it disappeared without dying in front of my eyes, so before I went to sleep, I made a wish. I wished that the cockroach would show up dead, because I wanted to sleep in peace. I immediately felt that my colleagues’ eyes were trying not to roll themselves. “That’s not magic,” one of them said. And their attention started drifting off to their mobile phones. And I laughed. What I failed to elaborate further was that the cockroach disappeared near the windows which were the opposite where the door was… So for a dead cockroach to appear in the morning at the opposite direction was really quite a miracle. I was truly convinced I had magical powers to do anything I wanted—I could command the law of attraction to get the Universe to do my bidding. I could almost hear myself cackling evilly. “Maybe I will wish for money to drop from the sky next.” I grinned at my colleagues, thinking they were foolish to dismiss me. I had no idea what I wanted to convey with my story, but I wanted to demonstrate 1) the power of thought; 2) what the universe can do for you; and 3) what you can achieve if you put your mind to it. Amazing huh? So Mondays don’t always have to be associated with the blues. 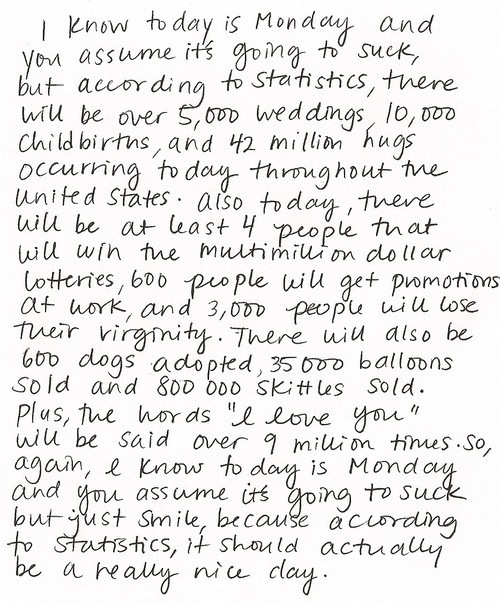 Mondays can be the days when anything you want will happen. Mondays can be joyful, but only if you allow happiness to be present. Start your Monday right and your whole week will be amazing, and maybe even magical. Why not, right? It’s “anything-can-happen” Monday. P/S: I was chatting with my friend on Friday night and she asked how I was doing relationship-wise. I said I have moved on since a month ago when I was at my lowest and on the verge of breaking down. I told her I’ve stopped looking at things I shouldn’t and stayed away from things that were harmful to my mind. When I removed the things that were blocking my recovery, I recovered faster. What I didn’t say was that meditation saved my mind too. It gave me clarity and a sense of calmness that lifted the heaviness in my heart. Maybe one day I’ll be less embarrassed to let more people know I meditate daily. Meanwhile, you should try meditating if you need some zen in your life.